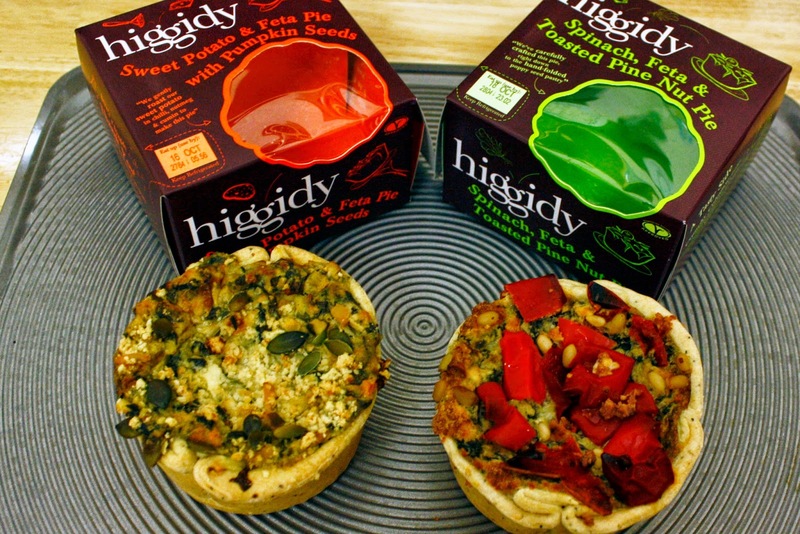 Pierate - Pie Reviews: Higgidy Pie Party, for two. Hello Pie-lovers! ARL here! What’s that? Who? 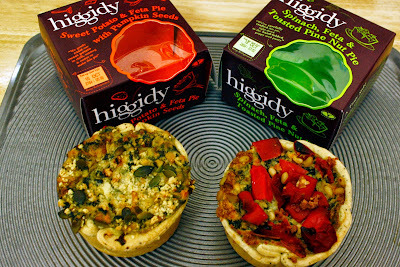 Yes, yes I know it has been a long time since my last review but I am back to review two pies from Higgidy: the Spinach, Feta and Toasted Pine Nut and the Higgidy Sweet Potato and Feta. I am slightly concerned that I am breaking my pie rating sabbatical by eating questionable pies, but questionable pies are better than no pies at all! Why are these pies questionable you ask? Well, the tops of these pies aren’t made of pastry! One has red pepper and pine nuts, and the other is topped with pumpkin seeds. However, I will leave debating the finer points of pie construction for another time and get on with the review. The veg/seeds on the top were a little on the brown side and even though it was given the correct cook time; I was worried about burning them, so the pies weren’t very hot all the way through. It is difficult to judge colour due to the toppings, and the pastry on the sides was still a little on the pale side. The difficulty of this style of pie is that the toppings cook at a different rate to the pastry/filling, which is why a fully encased pie works so well. 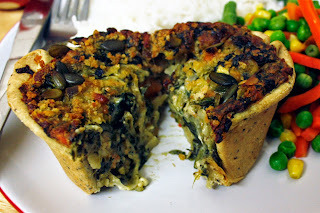 The spinach pie was consistent all the way through. Whether intentional or not the slices of (I think it was) onion has mostly settled near the bottom of both pies. The sweet potato pie was less consistent, with most of the sweet potato clustered in one spot. These pies were both absolutely full. The benefit of this style of pie is that there is no room for air bubbles. Both get top marks here. Whether it was due to being slightly under done or what, but the onion (like I said, I think it was onion, it could have been cabbage…) in both pies was a little on the chewy side. These pies were on offer at two for £6, making them £3 each (usually £3.70 at Waitrose). They aren’t the cheapest individual pies, but they more luxurious than most supermarket branded ones. These pies were pretty much the same apart from one had a few cubes of sweet potatoes in it. It was good content, but it was the same base of spinach and feta which was disappointing. A bit more variety between the two would have been good. These pies were very good condition which held well. They cut apart easily and I could shift them from one plate to the other without them falling apart. 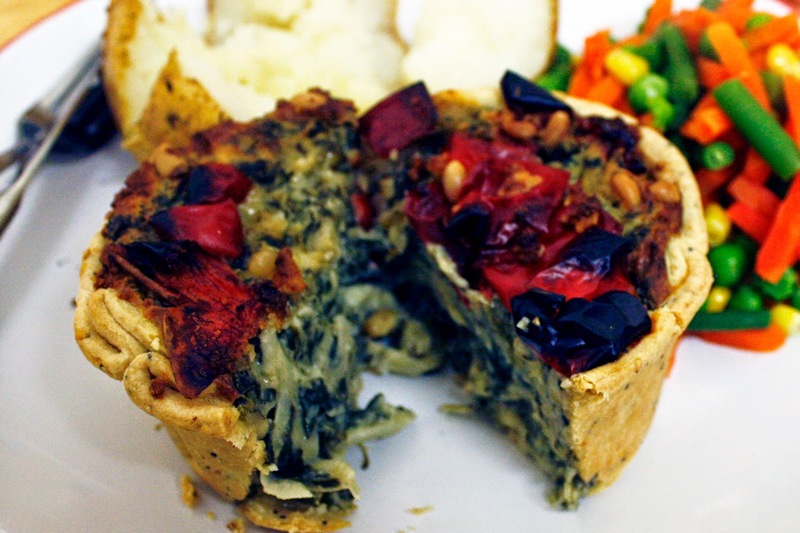 This review may sound negative but I did actually enjoy these pies! The respectable scores reflect this. Hopefully, I will be back soon with another review, though I am vegetarian now which will give me a much smaller pie-le of pies to choose from. Until then, ARL signing off!